After 14 years in the the VC business (and 20 before that as an entrepreneur) there are some basic “muscle memory” tools you develop that tend to be leading indicators of the health of a company you are involved with, part of, or an investor in. Most of the time when you are in the thick of things you simple respond to putting out fires or solving problems, at least that is what I was trained to do dating back to the endless number of problem sets I was assigned in order to get a BSEE degree. 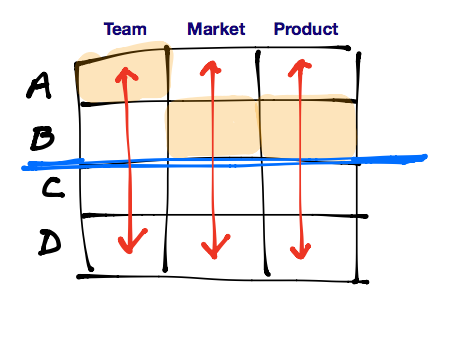 As I think about the things that can go wrong, which is what VCs are supposed to do versus what can go right, it really boils down to three very simple and obvious things: Team, Market and Product (or Value Prop). How many times have you heard the saying “I’ll take a B team anytime in an A market versus an A team in a B market”. Most brand name VCs swear by market and hence this frequently adopted phrase. Things are never completely black and white, but I have found that the continuous evaluation (and scoring) of your management team, the market you are in, and the value proposition you are offering your customers is a great way to try and proactively stay ahead of the curve to success or failure. The chart below is one simple way to capture the state of a company at any given time. You can think of them of grades (without the F), or use 1-4 if you prefer. In an early stage investment, you usually start off with the highest grade/score possible in Team and Market, and the promise of a great product or value proposition, which might have either market or technical risk associated with it (see my post on this topic: http://wp.me/p3Sj6q-2h). The real challenge starts as you race off with a fresh new pile of capital to hit value creation milestones before your next funding event. This cycle repeats itself and as you go through this progression, all shareholders (investors and management/employees) need to continuously evaluate how well the company is doing and whether success milestones are being achieved. In a candid process of self evaluation (by the board of directors and investors) if the company is getting good grades, you keep a steady course forward. Every company wants to be in the upper row with straight A’s, but even some B’s will still warrant ongoing support for the company’s forward trajectory from both management and investors. If the company is all D’s (maybe with a C sprinkled in somewhere) the answer is pretty simple as well, and usually management teams are ahead of the curve and should be aligned with what the outcome should be: stop investing capital, time, resources and energy and find as good an exit as you can, as fast as you can. Company’s that are doing well in some areas (are above average, like a solid B) and maybe average in other areas (like a C) are the ones that will cause the most consternation about what to do next. Clearly the first thing anyone would think of is “how do I improve my grade?”. The next question is “how long will it take?”. The most precious resource in a startup is time, measured is dollars being spent (burn rate) and time to market (competitive advantage). If you have either a team, market or product that is not firing on all cylinders, you have make a determination if you can fix the problem and how long it might take or whether it makes sense to look at other alternatives (often referred to as “strategic”, ie/ find a home or exit as fast as you can). I would argue that the most threatening to survival is if the market has changed in some way: either the route to market is too challenging, competition has changed the game, or the market pricing and assumptions are no longer valid. It is hard to recover from this unless you have enough runway to pivot, regroup and still see a shot at capturing market share with some of the value you have created. If the market is still valid, but the product does not address a pain point or create value for customers, it becomes a race against time to fix the problems. If the product problems cannot be addressed in a time frame before cash runs out or the competitive advantage is still relevant then it might make sense to consider other alternatives. The third category is team, and is usually the one that gets the most attention since market opportunity and product-market fit “problems” are often diagnosed as team related problems. Investors also tend to operate with two blunt instruments: cash and hiring/firing executives. The flip side is that team performance can often mask real market or product problems and by the time changes are made it is too late. There is no black and white answer on what to do if performance falters in one or more of these areas. I do know that the tradeoff is always time vs. value creation. As you would expect, the path to take is based on circumstances, and unfortunately often sub-optimized because there are many protagonists involved in helping shape the success (or failure) of a company. That being said, being vigilant and trying to be subjective about the performance of market, product and team will help. It should create an early warning system that might give you more time to make the adjustments you need to get your scorecard back to where it should be to in order to win. Or give you clarity on making the tough decisions that need to be made, including finding an exit or shutting down the company. July 25, 2014 in VC Learnings.